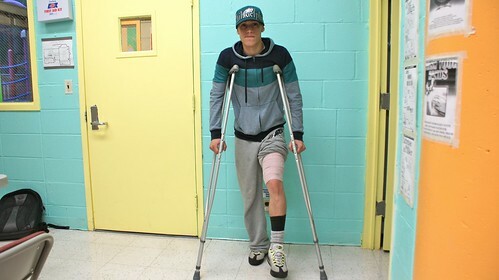 The young man who was shot in the leg at Campos Plaza has come forward to identify himself and to describe the horror of being stalked by a gunman in the early hours of Monday morning. David Cruz, 24, told The Local that he and a friend were walking back to his apartment on East 13th Street, between Avenues B and C, shortly after midnight when he noticed “a navy blue or black car creeping,” and then saw it double parked. “We looked towards the car, and I noticed somebody jump out the car with an all-black hoodie on, covering his face,” he said. The man quickly approached. “He started to run towards me and my friend. We ran towards East 12th Street, when he shot the first fire at me. My friend proceeded to run towards the basketball court and I proceeded to run towards the 635 East 12th Street tunnel when he shot the second fire that hit me.” The shooter wordlessly fired another two or three rounds that missed their target, said Mr. Cruz. 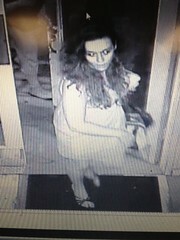 The police are on the hunt for a woman who stole a purse from Arlene’s Grocery on August 7. The suspect allegedly swiped the bag hanging below a bar inside the music venue at 12:50 a.m. Police said the bag contained a cell phone, wallet, cash and credit cards. 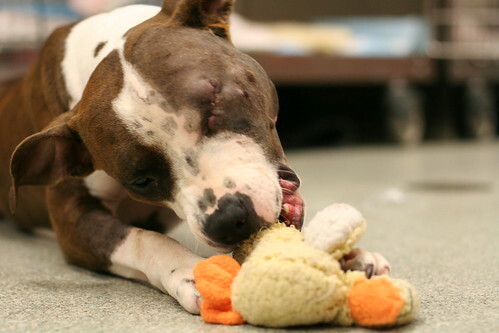 Animal Care and Control Star chews on a toy, undeterred by her missing eye. The pit bull who took a bullet from a police officer on 14th Street and lived to tell the tale had surgery today to remove her left eye, as well as metal fragments still lodged in her skull. 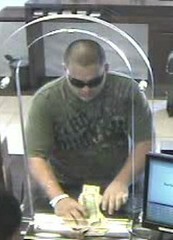 The police department has released a surveillance image of the suspect in Saturday’s bank robbery. The suspect passed a note to a teller at the Chase Bank on Second Avenue near East 10th Street at 12:40 p.m., the police said. The teller then forked over a wad of cash, and the robber made a run for it, toting a black Pullman suitcase. He is thought to be in his 20s or 30s, 200 pounds and five-foot-10. 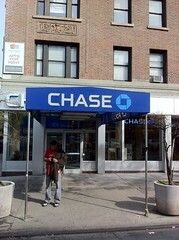 A man robbed the Chase bank on Second Avenue near 10th Street this afternoon. Around 1 p.m., a man passed a teller a note demanding money and then fled with an unknown amount, according to the police. The suspect, who wore sunglasses and black and yellow sneakers, was said to be about five-foot-eight with a medium build. It’s the first bank robbery in the neighborhood since the Emigrant Savings Bank, just a few blocks away, was held up in June. The pit bull that was shot on 14th Street has been turned over to the city after her owner failed to fetch her, and The Local has obtained the first photos of Star since she was shot while charging a police officer on Aug. 13. Richard Gentles, a spokesperson for city Animal Care & Control, said Star’s owner failed to claim her by a deadline of 8 p.m. yesterday, at which point she was released to the agency. Once she leaves the care center in East Harlem where she’s been recovering, she’ll be turned over to the Mayor’s Alliance for New York City’s Animals, a coalition of non-profit animal shelters and rescue groups aimed at insuring that animals are adopted rather than killed in city shelters. Mr. Gentles said his agency had arranged for what had come to $10,000 in medical treatment, most of which will be paid for by donations. He said Star was still resting and not ready for visitors, but – as with three previous status updates – her condition is improving. Police officers climbed a fire escape on East 12th Street today to calm a man who had been causing a disturbance. Melvin Felix The scene on Monday. 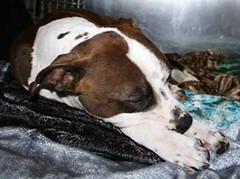 Star the pit bull is still hanging on for dear life after being shot by a police officer on 14th Street Monday. It’s still unknown whether the dog, if it survives, will be returned to its owner, who was passed out on the sidewalk when the shooting occurred and was arrested for an open warrant related to an open container charge. On The Local, commenters debated about who was to blame for the shooting. New York Police Department Surveillance video of the suspect. 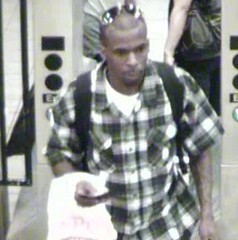 New York Police Department The suspect. A man followed a woman into 116 Avenue C on August 11 and punched her in the face several times before snatching her purse, the police said. The man, thought to be in his late 20s, made his move at 11:45 p.m. in the building near East Eighth Street. As the 28-year-old victim began to go up the stairs the suspect threw her to the ground, punched her and ran out of the building. A witness showed us a video he took of the shooting’s aftermath. owner of the dead pitbull looked on. 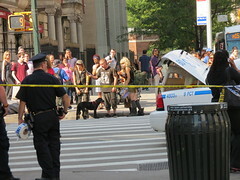 A police officer shot a pitbull that was apparently trying to defend its passed-out owner on 14th Street at around 4:15 p.m., horrifying passersby who watched the wounded mutt suffer a slow death. A man who identified himself as Steve-o, who was lingering at the scene near Second Avenue said he was a friend of the passed-out man, known as Pollock. The dog, according to Steve-o, was named Star. The police are now offering $32,000 for information that leads them to the man who shot a police officer in the Seward Park Houses on July 5. In the incident, Officer Brian Groves was patrolling the public houses when he came upon the suspect between the 18th and 19th floors. A brief chase ensued, and the suspect shot the officer, who narrowly escaped death thanks to his Kevlar vest. 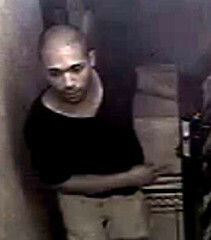 A man sexually assaulted a woman on a rooftop near Clinton Street in the Lower East Side on August 3, the police said. The pair entered the building together at 2:50 a.m. and then the suspect, who is said to be 5-foot-5 and in his early 20s, assaulted the victim and fled. Just yesterday, the Manhattan District Attorney announced the conviction of a 39-year-old man who was linked to a sexual assault in the East Village in 2008 thanks to a state DNA database. Mohammed Rahman, the Bangladeshi man clocked in the face and threatened by a pair of troublemakers, was back at work today at Astor Place serving lamb gyros, chicken over rice and the like. So, did the police get that guy who threw the punch? “It’s foolishness,” Mr. Rahman said. “I told the police, ‘He’s right there!’ One block away. They’re slow. They said call 911 if he comes back.” Since the incident on Thursday, which was followed by a threat to burn his food cart to the ground, Mr. Rahman has seen his attacker around. Fortunately, it seemed the man had cooled off. 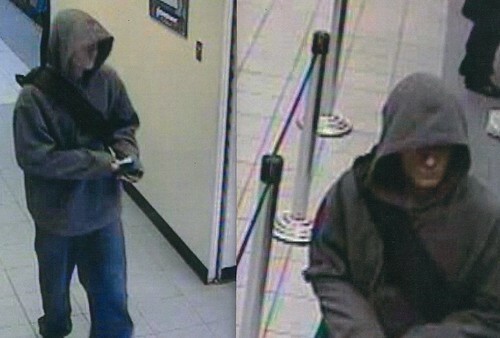 Stephen Rex Brown The scene at Emigrant Savings Bank around 45 minutes after the attempted robbery last month. 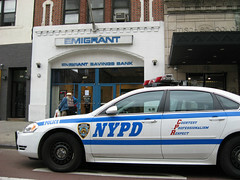 The police are on the hunt for a man in his 30s who made a failed attempt to rob an Emigrant Savings Bank on June 4. The suspect, who is thought to be around 5-foot-11 and 170 pounds, passed a note to the teller of the bank on Second Avenue at around 3:10 p.m. demanding cash. The teller refused, and the suspect took off, the police said. New York Police Department The suspected impersonators. The police are still searching for two men who posed as police officers late last year and attempted to rob two spas, one of which is in the neighborhood. 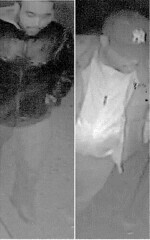 New surveillance images depict the men, who the police say posed as police officers at the Waterfront Spa on First Avenue on December 1. In that incident, the pair flashed a shield and asked to review the spa’s licenses and any cash kept on the premises, police said. A 55-year-old worker was grabbed by one of the suspects but not injured. A second incident on December 12 at a spa in Washington Heights followed a similar pattern. In both cases the victims refused and the suspects fled empty-handed. The suspected police impersonators were first covered in a police blotter in January. Earlier this week the police announced they were searching for a man who posed as an officer and robbed teenagers in the Bronx of their cellphones. New York Police Department A video released today. The Police Department canvassed the 179 apartments in the Seward Park Houses on Essex Street today, a show of force in the ongoing search for the suspect in last week’s shooting of an officer on patrol. The reward for information leading to the arrest of the suspect has also been raised to $22,000, as indicated in the video above. Here’s a sketch of the suspect in this morning’s shooting in the Lower East Side that likely would have killed a police officer were it not for his Kevlar vest. The incident happened in the stairwell between the 18th and 19th floors of the Seward Park Houses at around 3:40 a.m. While on a routine patrol, Officer Brian Groves came upon the armed suspect, who shot him in the chest after a brief pursuit, according to a statement from Commissioner Raymond Kelly. The Lo-Down reports a heavy police presence in the neighborhood. This will put a damper on his Fourth of July plans. A medic for the Fire Department was arrested early this morning after selling fireworks to an undercover officer, the police said. The suspect, Anthony Baijnauth, was selling the fun — but illegal — explosives out of a large bag stashed in his car at Norfolk and East Houston Streets at around 12:10 a.m., the police said. After selling some of the fireworks to the undercover officer, the 24-year-old resident of Queens was arrested and charged with unlawfully dealing with fireworks.